NEW FOR 2017 IS A 10 FT. X 54 INCH WIDE MODEL 120. 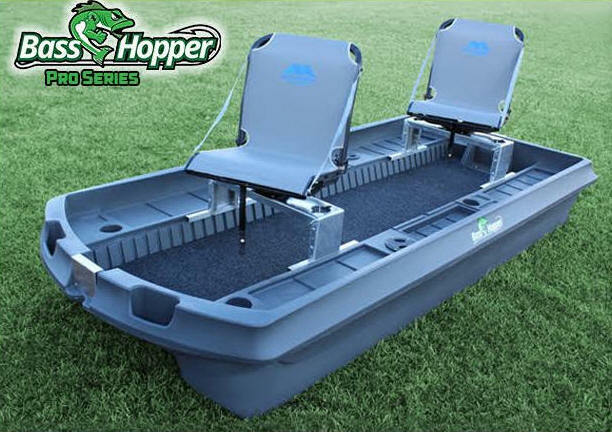 AVAILABLE IN A STANDARD MODEL WITH SWIVEL FIXED BACK SEATS OR A UPGRADE TO FOLD DOWN PADDED SEAT, OR AS IN PHOTO A Bass Hunter Pro 120 Series: Boat with Millennium SWIVEL, Marine fold down padded seats, carpet, adjustable height seat frames, Handling axle with tires. 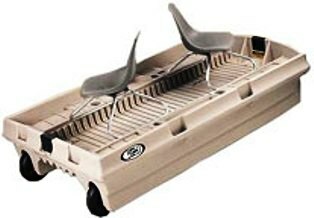 BASS HUNTER BOATS NOW MAKES ONLY 3 MINI BASS BOATS. 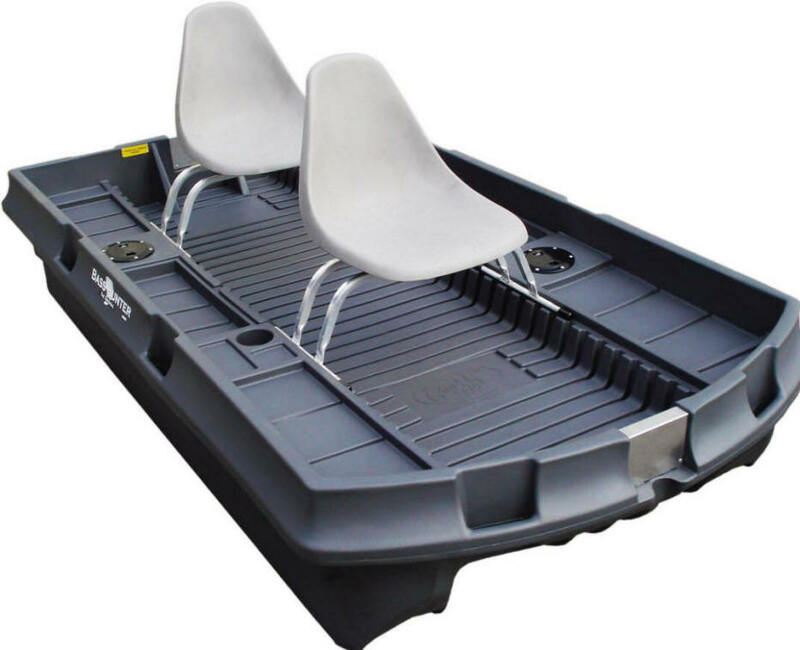 THE BASS BABY 8 FT. X 54 INCH WIDE WITH A 44 INCH WIDE TAPERED BOTTOM TO FIT EVEN IN MOST MINI TRUCKS AND TO FIT THE CUSTOM VERSA TRAILER MINI BOAT TRAILER. BASS BABY FEATURES WHEELS. 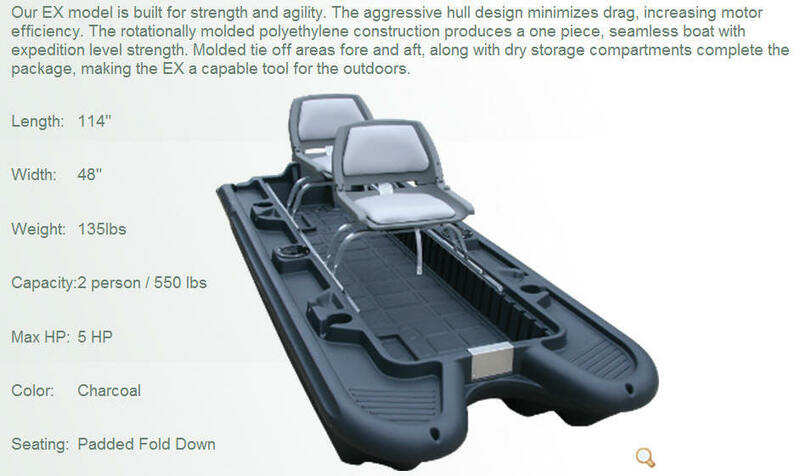 THE BASS HUNTER XL IS A 114 INCH. BOAT, 48 INCH WIDTH. A 10 FT. X 54 INCH WIDE MODEL 120. CUSTOM VERSA TRAILER MINI BOAT TRAILER CARRIES ALL MODELS WITH EASE OF LOADING BEING THE TRAILER DECK IS ONLY 12 INCHES UP FROM THE GROUND. DID YOU KNOW THAT THE ROOF RACK ON ALL THE ABOVE VANS AND ON MOST OTHER SUV AND SPORT UTILITY WERE MADE ESPECIALLY TO CARRY OUR MINI BASS BOAT AND OUR CANOES, JON BOATS, SEMI VEES AND KAYAKS SAFELY AND THEY LOAD AND UNLOAD EASILY. 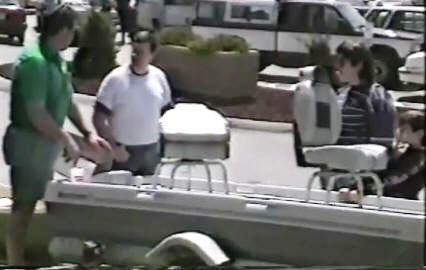 AS YOU CAN SEE THIS MINNIE BASS BOAT LOADED EASILY. STRAP IT DOWN AND YOU ARE READY TO GO. ON THE LEFT IS OUR YUPPIE WAGON TRAILER ON THE ROOF RACK IS THE BASS BABY. .IN LESS THAN 5 MINUTES THE BASS BABY GOES ON OR OFF YOUR VEHICLE. THE BASS BABY IS RUGGED AND BUILT TO GIVE YEARS OF FISHING FUN! 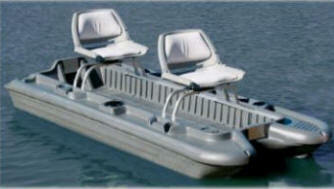 The Bass Baby is a two man fishing boat that offers fishermen and women a durable and long lasting two person boat. 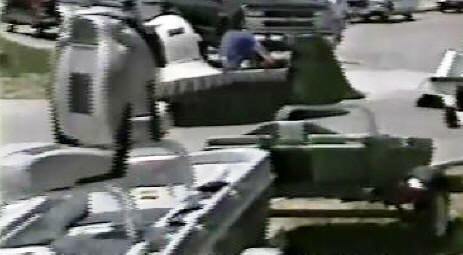 Anglers who want to fish small lakes and/or ponds, but don't want to invest in an expensive fishing boat, will be glad to discover the Bass Baby. 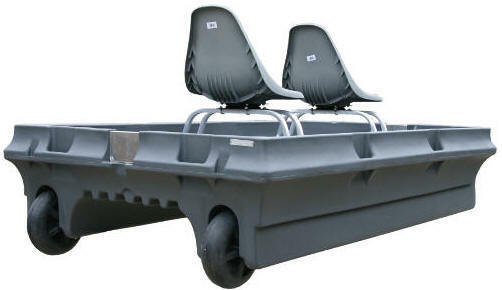 This unique 8' fishing boat has wheels to get you into those secluded fishing holes. 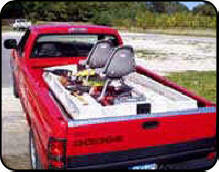 Just put the Bass Baby in your pickup bed and head to your favorite fishing spot. The Bass Baby® will get you to the fish. It's never been easier than with the Bass Baby! It fits in most full size trucks! 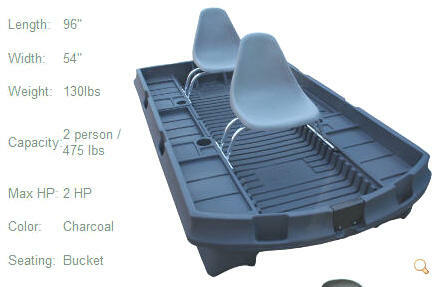 a slight 143 lbs and is rated to carry a 475 lb load, while meeting the strict safety regulations of the U.S.Coast Guard. 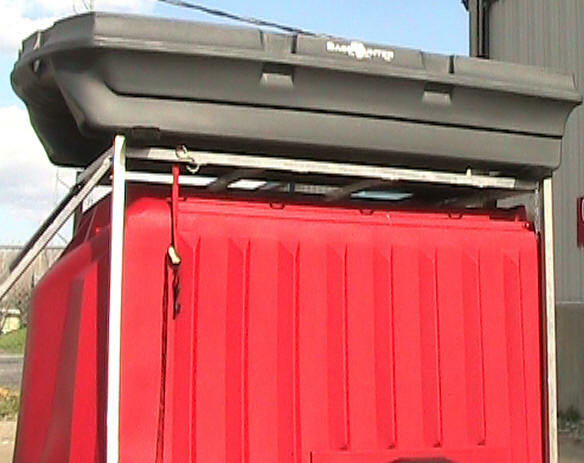 It requires the tailgate to be down on short bed models to be flat in truck bed. CUSTOMER CAN CHANGE SEATS, AS STANDARD 4 HOLE PATTERN IS USED. 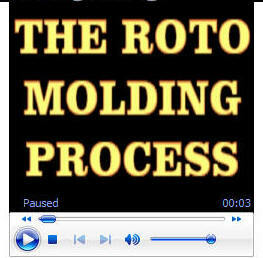 Molded in polyethylene foam -- the benefit is that it will never absorb water like traditional foams. In general, the public thinks foam is what makes the boat float; but technically, it is the displacement of water. Plastic is lighter than water and the surface area gives you the buoyancy. The photo shows that the floor of the boat is filled with foam. This foam gives extra support and gives you a very secure feeling when walking in it as well as it provides the safety required by the U.S. Coast Guard. CHOOSE A TRAILER AND YOU ARE ALWAYS READY TO GO ON A MOMENTS NOTICE. WE DELIVER RIGHT TO YOUR HOME, BUSINESS OR TO THE LAKE. 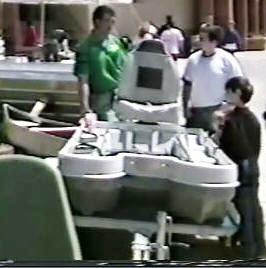 MINI BASS BOAT ON A VERSA TRAILER IN 1991 AT THE MILITARY AIR BASE SHOW. OUR BOATS ON THE VERSA TRAILER HAKE BEEN PROVEN TO BE THE BEST ON THE MARKET. 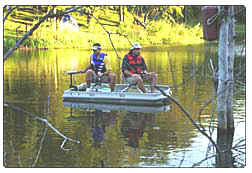 THE BASS BABY AND THE BASS HUNTER BOATS ARE THE BEST BECAUSE THEY ARE ROTO MOLDED.